Last Saturday as many as 2,000 Cracovians gathered around the Radio Krakow building on the busy al. 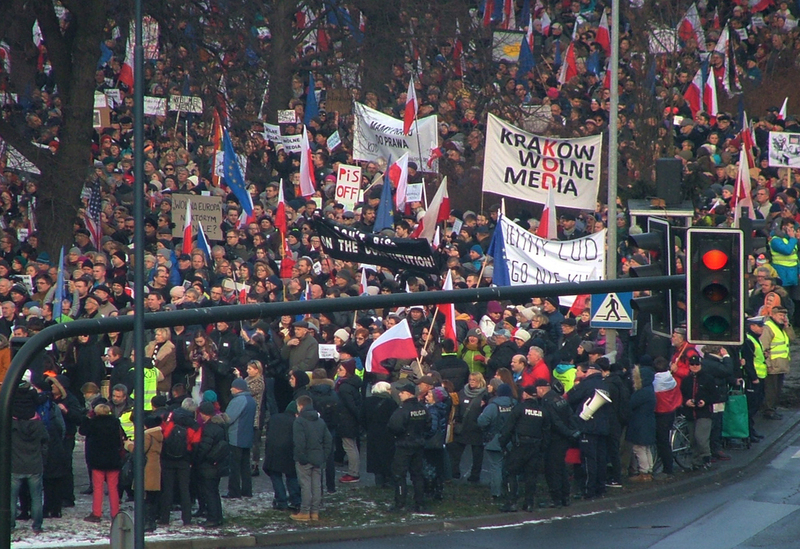 J. Słowackiego to protest recent moves by the Law and Justice (PiS)-led government to place the media under greater state control. The controversial law, signed by President Andrzej Duda last week, gives the Polish treasury minister the power to hire and fire the broadcasting chiefs of public TV and radio stations, taking this role from a media supervisory committee. Opponents fear this will make stations like TVP, where many Poles go for their information, unfairly biased in favour of the conservative government. Demonstrators waved signs and flags of Poland, the EU, and even the US, while others placed duct tape over their mouths in silent protest. Overflow from the crowd gathered on the avenue’s median while speakers denounced the government policies. 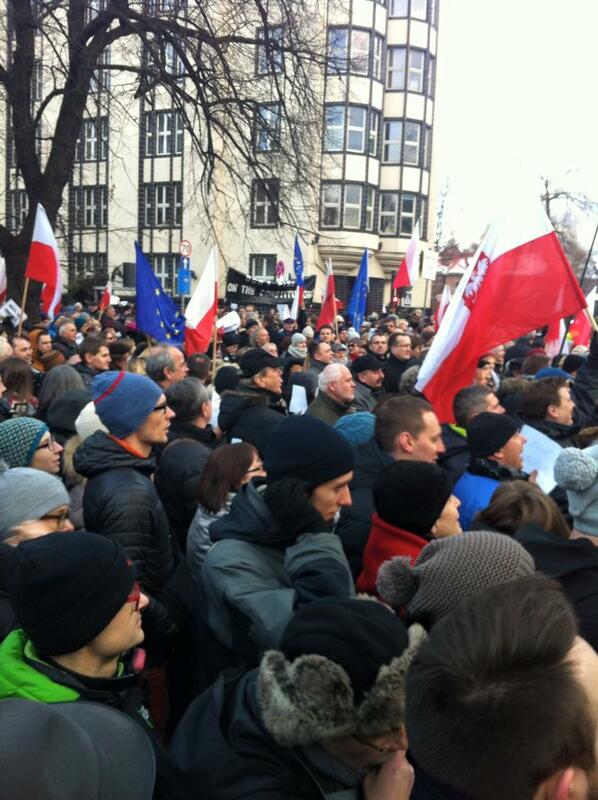 The event, with others like it springing up in Poznań and Wrocław, was supported by the newly-formed Committee for the Defence of Democracy (KOD), which also organized nationwide protests last month against PiS’ controversial policies toward the constitutional court. 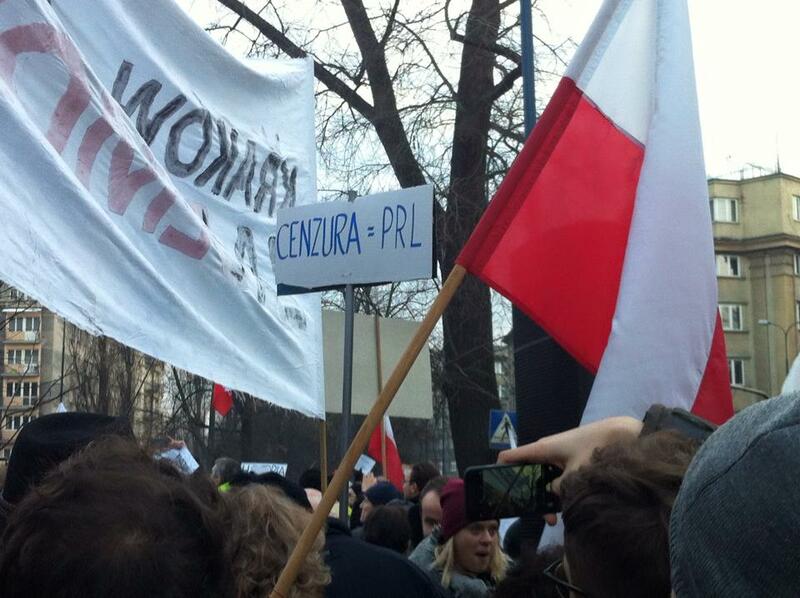 After the demonstration, the local PiS office could also be seen papered in slogans from the event. ← PiS leader Kaczynski meets with Hungarian PM Viktor Orban: What does it mean? In the West so much of the media is owned by a few very rich, English lords, oligarchs and so on! People like Rupert Murdock get to sit down with leaders and talk about their ideas for them, for us. Obviously blatant conflcts of concentrated interest! Try to get one of these guys to do some stories and you see what happens, nothing happens, all too often. Look how long it took to get out the very sad story about what happened in Cologne (Koln) out? In Canada there are a couple of guys that own and control a lot of the media and communications. One has worth of more than 20 billion. 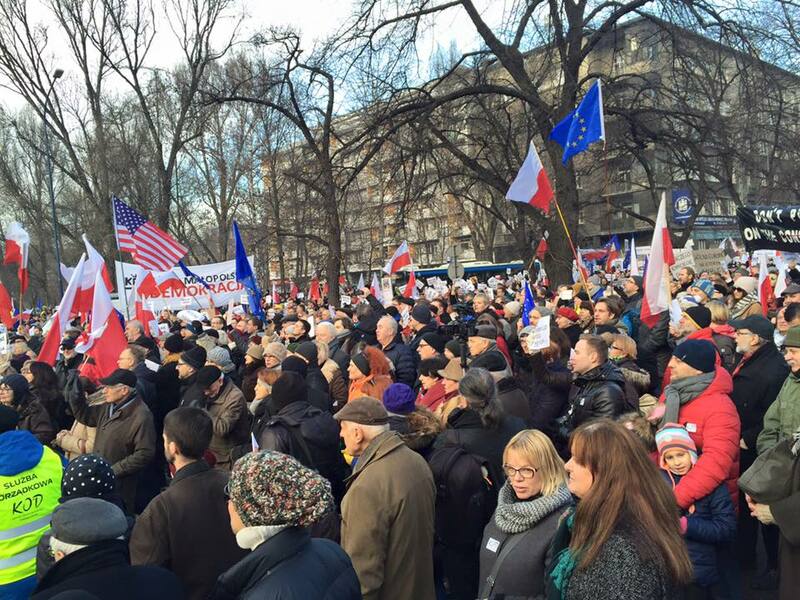 I am sure that some would be glad if Poland SOLD OUT more of Poland! Censorship is a real issue in Germany. During a recent volleyball game Polish fans unfurled a banner saying “Protect Your Women Not Our Democracy” and were immediately assaulted by German Luegenpolizei. Some of the fans were beaten. The situation in Germany is getting downright scary. I hope it doesn’t end up being 1953 all over again. And now, ladies and gentlemen, the act you’ve all been waiting for – the man with limited Eurovision, the one and only Jaroslaw Sinatra! He’ll be singing his fabulous hit “I did it my way” with his backing group the PiS Artists. Take it away, Mr J…. I demand an immediate end to all of these PiS jokes! If you don’t stop, I’ll have to change the name of the party! And do you think I care about the Eurovision? The Italians lived without it for years! As an outsider myself (a Brit), without any voting rights in Poland, my concern is primarily how the country of my parents is being perceived in the outside world. Mr Kaczynski may be almost dictatorial and his remarks labelling anyone who opposes his policies as “traitors” is not exactly the hallmark of a diplomat, but at the same time I find the scenario of western journalists lining up to lecture Poland on democracy quite disconcerting. And, yes, Mr K – you really ought to think about changing your party’s name, otherwise everyone will be forever taking the PiS. In Australia the government already has the power to hire and fire public television directors, but the ABC is still a leftie paradise even under conservative governments. I believe it will be the same case in Poland. Yes, but is there anyone who isn’t biased in this debate? And what seems to be particularly upsetting to the western European critics is that Kaczynski’s party is not slavishly following the EU line, more than any concerns about Polish democracy. I have a feeling that Polish voters will soon tire of this man’s personal crusade and his rather unpleasant style and will give him his marching orders at the next election. The trouble is, he could do a lot of damage before then. What do you mean “unpleasant style”? I’m not personally responsible for offensive magazine covers. It’s a free country, isn’t it? Everyone is always free to criticize Germany. It won’t work anyway. As dictators in the Middle East have discovered, you can’t control information these days in the way that used to be possible, not with twitter and face book and blogs all over the place. Shut down one website, and instantly six others spring up in its place. I am sure the youngsters in Poland are just as smart as those elsewhere. All that will happen is that the government will ruin its reputation. Prime Minister Beata Szydlo’s speech at the European Parliament was very convincing. She certainly doesn’t sound like anyone’s puppet. Does the government really need the guidance of J. Kaczynski or would he be better off in comfortable retirement somewhere, writing his memoirs? The Ukrainian ambassador says they are not refugees but economic migrants. Would they be in Poland if it hadn’t been for the turmoil in Ukraine? Maybe the million figure is exaggerated, but it sounds like the Polish PM is closer to the mark. Ukrainians and Poles are of the same race – of course, they are welcome. We’ll take Belorussians too. Our country for our people. Everyone else RAUS. As a European I feel frightened by you – Poland is part of the EU and, like it or not, ANY EU person can move to Poland. Your old Poland is now gone. If you enjoy Europe, let Europe enjoy your country too. I think Ricardo was being ironic (clue: the word ‘Raus’) and does not speak on behalf of all Polish people. Do you speak on behalf of “all Polish people”? You speak a lot. If you had read my comment at no.5 above, you probably would not have asked your question. I dislke PiS with a passion, but it does seem that Germany has more issues with freedom of the press. Facebook and Google have, under instructions from Angela Merkel agreed to remove all comments critical of Germany’s suicide mission of letting in millions more Muslims in to Germany and hence Europe. Ha! And these are the people criticizing Poland’s media laws. You have to understand that there are only two groups who criticize Poland: 1) internationalist capitalists (typically German but not only) and 2) the far left (New York TImes etc). Are you a defender of the new Polish government then? How would you characterize their attitude towards foreigners?